The community of Verona was started by A. R. Womble around 1876. He had a grist mill and a cotton gin. There were Methodist and Baptist churches and a school in the area. At first the name "Mississippi" was applied to the area and later "Womble." The name was changed to "Verona" when they applied for a post office. One of Womble's daughters had that name. 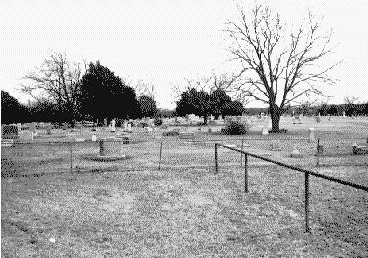 In the write-up for the Womble family in COLLIN COUNTY, TEXAS, FAMILIES, it says that the land for the Baptist Church and cemetery was donated by E. M. and Lizzie Womble St. Clair in 1887. The deed in Vol 21, p 150, says that the land for the cemetery was donated in 1883 by E. L. Woodall. The church was located north of the cemetery. In August of 1912 a terrific northeast wind measured at 150 miles-per-hour blew away the church. Many people were injured, but none were killed. The Womble School was located nearby. 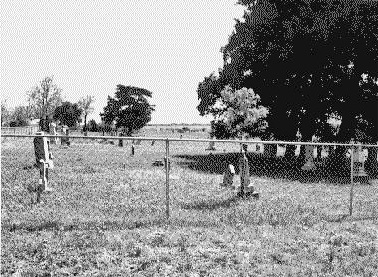 This cemetery is divided into two separate parts about 50 feet apart. The smaller section contains about 6 or 7 graves dating from 1955. The larger section covers several acres, and has several hundred graves. It has recently been fitted out with a 4-foot chain-link fence and gate. The cemetery is well maintained and has several cedar trees. It is by itself at the end of a dirt road.